In news that drive a chill through the heart of most parents, the school lottery My School DC, opens today and is ready to accept your school applications. The application period is open from today, December 10, through February 1, 2019 for 9-12 grades. For grades PK through 8th grade, the deadline is March 1, 2018. The lottery results will be posted on the site and shared via email to parents who opt to do so on March 29, 2019. What is My School DC and why do you need to know about it? My School DC is a one-stop portal that accepts applications for District of Columbia Public Schools and charter schools. Through this portal, you can apply for up to twelve schools for each child. If you’ve created an account before, you only need to enter it again along with your password. (Or, you know, reset your password because you only do this kind of thing once a year.) Within the application, you can request text messages about your application. As you add schools to your application, you can also click on a My School DC link to gather more information about the school to which you are applying. The site will also prompt you to rank your selections in order from most to least desired. Once you submit your application, you can still log back in and either edit or delete your application in the My School DC portal until the deadlines come. Good luck to all parents! 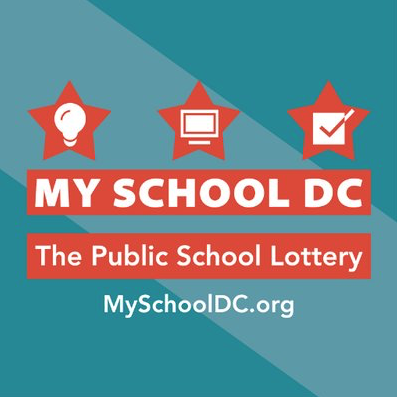 My wish for us all is that, at some point in the future, all DC schools are so good that no one feels like they need to enter a lottery so they can get into “the good” school.